Do you know what to do with that old computer monitor sitting in storage? What should you do with a retired PC or tablet? If the items cluttering your home were newsprint, plastic bottles or aluminum cans, you would know exactly what to do with them – recycle! But if you’re unsure how to recycle technology, you’re not alone. Recycling technology is good for the environment, the EPA says. Valuable resources like metals, plastics and glass can be reused; every 1 million cellphones recycled yield 35,000 pounds of copper, 772 pounds of silver, 75 pounds of gold and 33 pounds of palladium, according to the EPA. What’s more, recycling or donating electronics reduces consumption of natural resources, greenhouse gas emissions, and air and water pollution associated with making new materials. 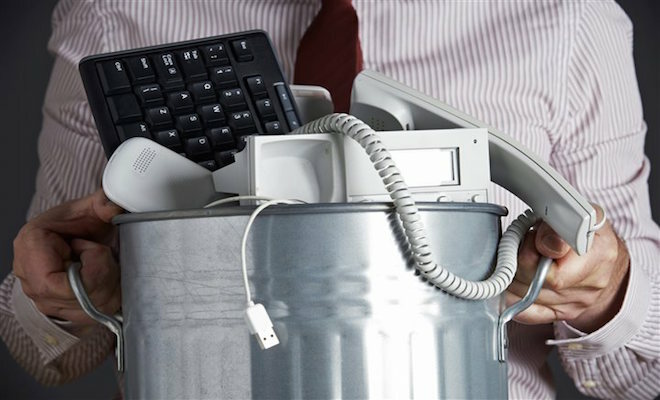 * You can recycle old office technology that no longer works for free by taking them into your local Staples. The store will accept the computers, monitors, printers and numerous other types of electronics for recycling – free of charge. For more information on the program and a list of tech items that can be accepted into the free recycling program, visit Staples online. *You can also trade in eligible technology to receive a Staples eCash card that you can use toward your next in-store or online purchase. The laptop that’s too slow for your gaming activities might qualify for a trade in and get a gift card to put toward new technology or anything else you need within the store. * Equipment that still works can also be donated. Goodwill accepts technology items for repair and recycling and schools, churches, charities and other community organizations in your area may accept older tech that’s still usable. You can also find computer donation organizations with a simple online search. Before you donate any piece of technology, be sure that the organization can use it and you won’t burden them with items they might have to recycle. Also be sure to delete all your personal information, including files, documents and apps that may contain personal information. Staples provides this service in stores through their Tech Services.